Yet another iteration of superfluous style and too-little substance from the vibrant wing of Hong Kong action-fantasy, Painted Skin: The Resurrection spins a yarn of demons, humans, and the fleeting nature of beauty with a painterly perspective that's about a superficial as the messages it conveys. Reuniting a substantial chunk of the cast from the original Painted Skin, notably lacking Donnie Yen and Gordon Chan as director, this new film from Wuershan isn't one to lack for visual flare, where blooms of mystical light and elaborate eye-grabbing costume fare fill every impeccably-framed shot, emphasizing extravagant high-fantasy. While there's something innately poetic about vivid images guiding a story of misconstrued love and a demon embracing corporeal life for the sake of experiencing feeling, the lavishness here rings hollow, the "beauty is only skin deep" idea unfulfilling beyond giving the audience a skeleton for draping its colorful, high-energy mythology. The story starts with the crackling of ice, where a bird-demon frees a beautiful (humanoid) fox demon, Xiaowei (Zhou Xun, Flying Sword of Dragon Gate), from the frosty prison that's kept her suspended for centuries. She's unable to sustain her beauty outside the ice without consuming the hearts of men, (one of which will come back to haunt her later on), a blight she can shirk if a man willingly offers his "heart" to the demon -- which, coincidentally, would make her human. On her journeys across the land, Xiaowei bumps into Princess Jing (Zhao Wei, Warriors of Heaven and Earth), who's traveling to proclaim her love for her once-guardian, Huo Xin (Chen Kun). Sporting a tortured soul and a gold mask to cover her disfigured face, as well as the baggage of a marriage betrothal, Princess Jing affords Xiaowei an opportunity to manipulate the situation: give beauty and immortality to the human in exchange for her heart. Bargains ensue, and the work of demons clouds the relationship between Princess Jing and Huo Xin, one already obscured by events of the past that led to the princess' disfigurement. At a cursory glance, Painted Skin: The Resurrection appears to be a steady, immaculately-composed hybrid of historical-esque martial-arts action and mystical costume drama, especially in relation to the first film's aggressiveness. Wuershan opts to use the fabled storybook setting more for winding romance and mystical suspense in Xiaowei's machinations, though, and its visual tone follows those cues: slow-motion shots adorn scenes that would make Zack Snyder and Tarsem Singh proud, from demons breaking through sheets of ice and swirling in water to the rare fight sequence breaks up the stretches of magic-driven melodrama. The audience must excuse meager special effects and leaps in practicality for the grandeur of its fantastical opulence, where shattered ice, rushing frost, droplets of water and flying birds themselves can be unconvincing and hamper their scenes. Others, in which demons strip off their skin or flap their wings, justify the patience. It's often guilty of sensory overload, but the rich textures in the costumes and locations can be striking enough on a smaller scale to justify the bigger embellishments. Intriguing female characters drive Painted Skin: The Resurrection, and they drive it well --- even if they'd be far more so if they weren't fighting through a thicket of anime-caliber exaggeration. Princess Jing embodies a hardened, complex, yet vulnerable personality that wraps around the prospects laid out for her with convincing inner conflict, where Zhao Wei's wide-eyed glances reveal depth in the character's contemplation -- and trepidation -- in the presence of both the demon and Huo Xin. Conversely, the fox demon Xiaowei is lithe and manipulative when given life by Zhou Xun, whom I really enjoyed in The Banquet and Balzac and the Little Chinese Seamstress; her nuance and persuasive demeanor fit the fox demon perfectly. And even though she's relegated to a throwaway side-plot involving a ramshackle, unskilled demon hunter who becomes nothing more than a device on-hold, it's hard not to be disarmed and captivated by Yang Mi's insistent performance as the lower-level demon playfully tormenting him. Perhaps it's best to just surrender to the characters and vibrant visuals in Painted Skin: The Resurrection and get swept up in these flights of the imagination, into the tragic romantic intentions laid out by Princess Jing's forlorn internal conflict and the war over her literal and figurative heart. But it's not so easy to do when the story itself is a mixed bag of watery themes, questions conveniently answered with "magic", and conflicts set in motion just to keep the film moving along, such as a war ignited for the sake of having a combat situation amongst typecast villains. 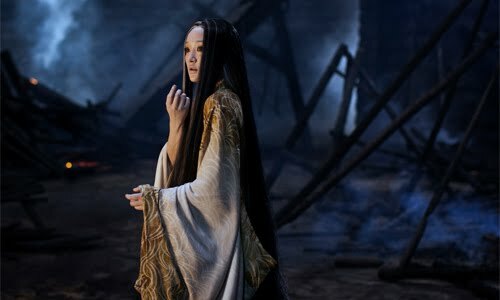 Wuershan's artistic perspective keeps one's attention- nearly every scene in the film could be repurposed as fantasy-inspired wall artwork -- but as the magical threads intertwine and complicate, the levelheaded elements of mortality and one's perception of beauty get lost in overtly-ornate and embellished displays, obscuring the story's trivial purposes in an emotionally flat docket of contrivances. Because of that, the visually-sumptuous battle over Princess Jing's heart, oddly enough, lacks the heart needed to give it purpose.